Freescale Semiconductor introduced the Kinetis KL02, the world’s smallest ARM MCU, at Embedded World 2013. KL02 is an ARM Cortex M0+ micro-controller designed to address the miniaturization needs of the Internet of things, and its size (1.9×2.0mm) makes it suitable for applications such as ingestible healthcare sensing, portable consumer devices, remote sensing nodes, and wearable devices. 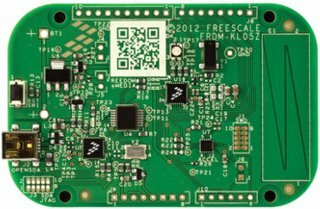 Freescale Freedom development platform (FRDM-KL02) and related tools should be available in July 2013, but in the meantime, Freescale suggests customers to start development with FRDM-KL05Z Freescale Freedom development platform which will be available in March/April. Kinetis KL02 CSP MCU should start sampling to key customers in March 2013, which broad market availability planned for July 2013. Unit price should be around $0.75 cents in 100,000-unit quantities. To learn more, visit freescale.com/Kinetis/KL02CSP, or alternatively, if you are currently at Embedded World in Nuremberg, Germany, you can visit Freescale booth (Hall 4A, Booth 206).